Olivia’s style and beaming personality is something we’ll miss around the showroom. Olivia and Ryan were married on July 29th at the incredible Bellamere Winerey in London and right from the beginning we forged a connection. For Olivia, we designed and decorated a lavish, enchanting ‘Alice in Wonderland’ themed bridal shower. 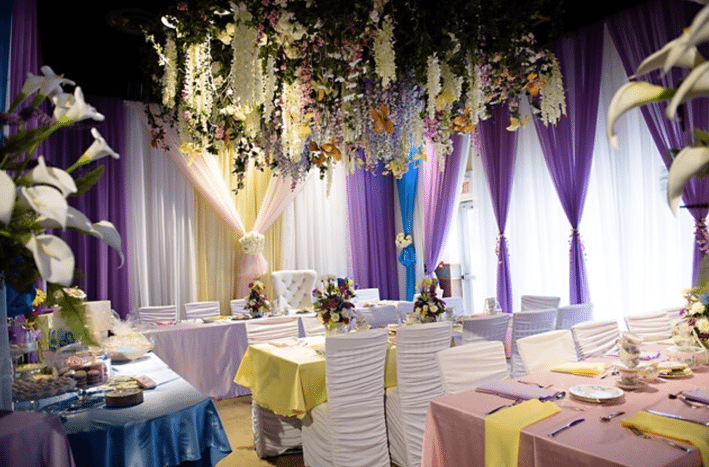 We combined an array of pastel coloured linens and flowers to call on the wonderment of the theme. 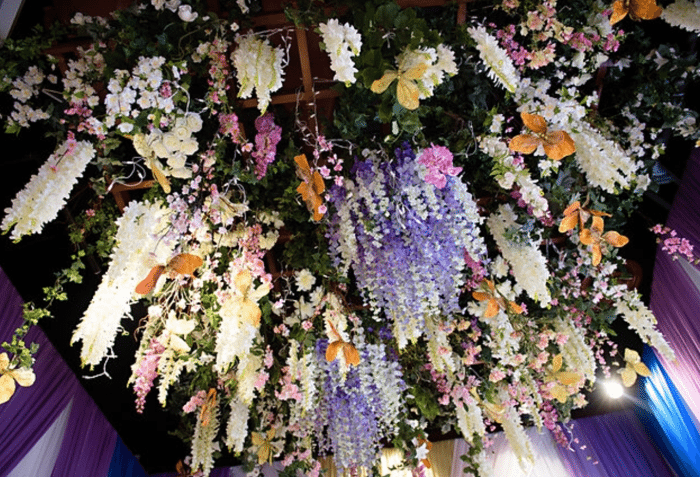 We hung a cluster of colourful flowers from a suspended feature which transported guests into the middle of Alice’s adventure. Luxe calla lilies, chair covers and our comfy white bride chair perfectly matched Olivia’s elegant style. While designing her shower, we learned Olivia’s style was luxe and glamour with a big splash of elegance which made us extremely excited to decorate her up-coming wedding at Bellamere Winery. 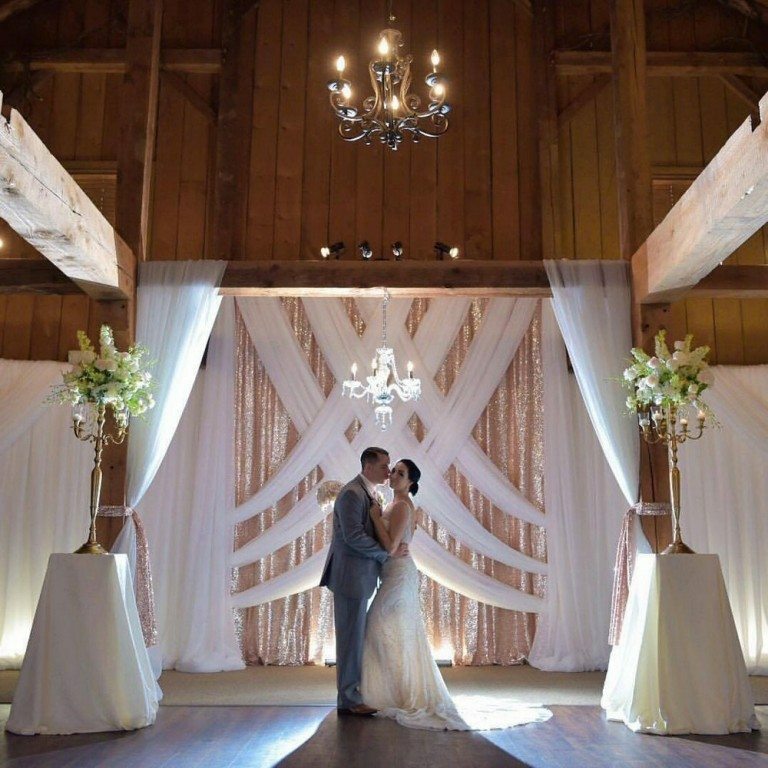 The winery’s gorgeous rustic charm meant that our glam décor would be a perfectly eye-pleasing contrast, making jaws drop and dreams come true just as we had at her bridal shower. Every detail for Olivia and Ryan’s day was stunning. We created a custom backdrop to reflect her unique style and fabulousness which we excitingly launched as the ‘O-Livia Backdrop’. With orchid centrepieces, broach details, lace sequin overlays on the head table and chandeliers overhead, Olivia’s vision was picture-perfect! Just when it felt like it couldn’t get any better, the absolutely talented HRM Photography (hrmphotography.com) was there to capture every last detail. We created a custom backdrop to reflect her unique style and fabulousness which we excitingly launched as the ‘O-Livia Backdrop’. This stunning couple’s wedding was an unforgettable affair and the bride’s infectious personality has left a beautiful mark on our team. With one-last post-wedding visit we were given the most amazing thank you letter which explained that our relationship would most-definitely continue on. The best part of our work is seeing the expression on our couples faces during the big reveal and knowing we can help make dreams come true. What’s even better is that with every event, we’ve gained another friend. 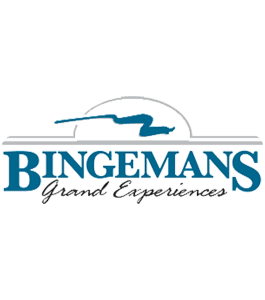 Stop by our showroom for a visit, we can’t wait to meet you! You can reach owner, Wendy Bennewies, and the team at Devine Wedding Design directly using the form below. Or you can call her at the Mitchell number, 519-348-4191, or the Stratford cellphone number, 519-801-5671.